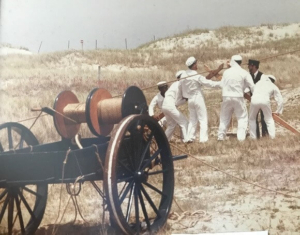 Junior ROTC Students from Camden County High School under the leadership of Master Chief Lyndon Dupree (USCG-Ret), who is their Maritime Science instructor, will be performing the Beach Apparatus Drill on Friday, August 11, 2017, at 2:00 pm. Assisted by members of Chicamacomico’s drill team, these students will be experiencing both the history of the service and the importance of functioning as a team. Do join us for this unique opportunity: the drill will be included as part of the regular admission to the Life Saving Station and Museum.